I’ve been back in the workshop for a while now; definitely overdo for a new blog entry. I’ve completed a couple of projects, and the gremlins have been out in force. Oh, sure, I could just be rusty from the winter break; but the problems have just been too weird. 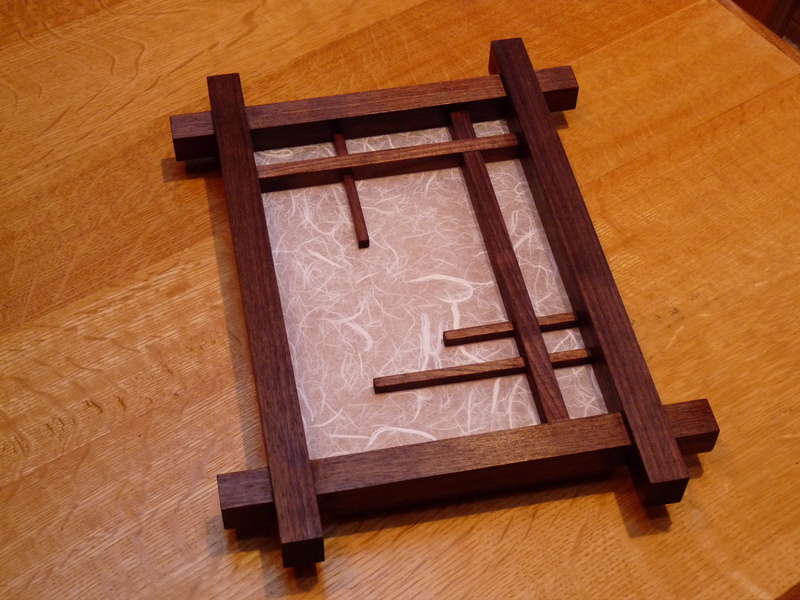 The first project involved making two mini shoji screens to cover some ugly wall speakers. They are made out of walnut, with two different, yet related, asymmetrical designs. Aside from the basic stock dimensioning, most of the half lap and rabbet joinery was all hand work. A really nice way to tune up your sawing and chisel skills (and break in my new set of mortise chisels.) Aside from the outer frame, I used different widths for all of the elements, and different thicknesses, giving many nice shadow lines. 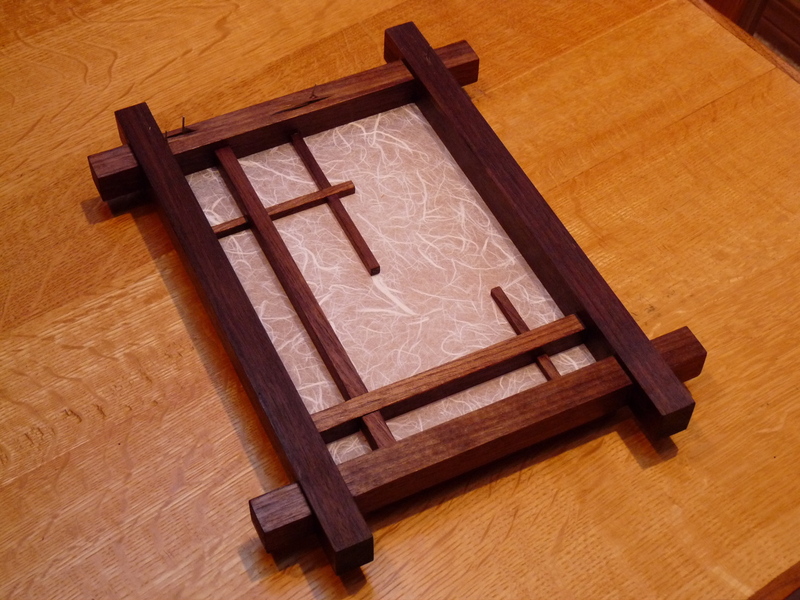 I had picked a bundle of different, handmade, papers to choose from, and selected one that worked well with both the shoji frame, and the speaker grill that it was going to cover (also making sure that it didn’t affect the sound). 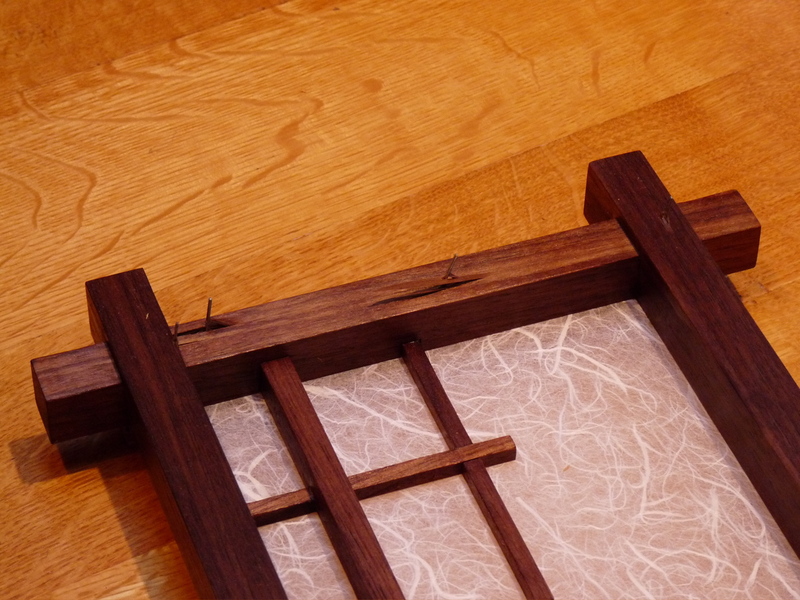 After finishing the frame with an oil varnish, I glued on the paper. You don’t have to have the paper super tight at this stage, just be careful to avoid any puckering. The next day, after the glue has fully cured, I sprayed the back of the paper with water and set it in the sun to dry. Presto, the paper is nice and taught. Then came . . . the Gremlins! I had milled a simple mounting piece to hang it from the wall and went to nail it on. I checked the length of the nails, opened up the nail gun, checked that it was empty, and loaded the 5/8″ brads. A few pulls of the trigger and its done. But, hey, wait a minute, why is it stuck to the cork board I was working on? There are four brads, merrily poking through the front. The other project is a cabinet, similar to the one(s) that I made for the school‘s Fine Arts Atrium. This is a single, shallow unit, that will hold the poster for whatever concert is coming up. Construction is the same as the other, with large G&G type finger joints, but when I did the glue up of the box, something looked odd; it didn’t look square. Sure enough, Gremlins had struck again. Even though I used my accu-miter with a stop to cut the pieces to length, even though I had done a test fitting and checked for square, after the glue had cured, one side was 3/8’ of an inch longer. I still haven’t figured this one out. But here is where I can gauge my progress as a woodworker. I was able to figure out what was wrong, and, more importantly, how to fix it. Luckily I had used liquid hide glue, so cutting the offending side out was not a big deal. I made a new side (the correct length this time! ), redid the joinery, reglued, and back in business. All that is left to do, now, is to make the cleats and hang it. Gremlins are always hanging around the shop, and everyone will encounter their mischief from time to time. Everyone, even masters, will fall prey to them occasionally. Look back through the ‘casts of Tom MacDonald, the host of WGBH’s new WW show, and you will see him, in his bombé secretary build, have to rip out and redo a major structural part. Knowing how to fix mistakes, and not being satisfied with sub par work, is what shows us our growth. Let the Gremlins do what they will, I’m ready for ’em! This entry was posted on April 7, 2010 at 5:14 pm and is filed under Acorn House. You can follow any responses to this entry through the RSS 2.0 feed. You can leave a response, or trackback from your own site.